The courage of a Makar, Bones. To foul the ground of Sacred Blood. Has raised itself a new Noth Pole. Sorry, I actually think this is blasphemous, and also that it steps over the line of charity and respect for the Pope. Nasty, acerbic.. the 'measure of goodwill' in your self-indulgent 'litany' is zero. Glad to 'go elsewhere' to blogs that offer constructive criticism without resorting to invective lists. the amount of time 'working' on such a list is self-indulgent and displays zero goodwill. glad to go elsewhere to blogs that offer constructive criticism without resorting to puerile invective. From The Bishop of Rome- Lord save us.Amen. Maybe not so good. Got stuck on alliteration. If you actually spent as much time on things spiritually edifying, your blog might actually have content worth reading. What does this add to your spiritual life? You don't like Pope Francis. We get it already. I think the first seven, and last three, lines are outdated and we have moved beyond those rigid ideas . . . Yes Mr Bones, how dare you waste time on this trash that you could have spent knitting sandwiches for the poor. You're a very bad person! I mean, who are you to judge? I'm afraid Americans don't "get" our gallows-humour. My suggestion: "Promoter of Windpower" from the Litany of Laudato. Can't you see that he is crying out in spiritual agony for the campaign of contemptuous rebellion against Our Lord God and His Holy Church presided over by Pope Francis? Not to mention the countless souls he is leading into iniquity and from the Holy Faith? Lord, have mercy! Thomas said...Sorry, I actually think this is blasphemous, and also that it steps over the line of charity and respect for the Pope. But it's not uncharitable of the pope, as well as disrespectful to others, for him to actually say such things? Does the pope have no obligations towards charity and respect, or does he get to say whatever he likes merely because he is the pope? Is it disrespectful? Yes. And is it not therefore inappropriate? Well, the Pope sometimes makes me feel he doesn't want me in his happy, gay-friendly, doctrine free church. A bit of satire helps dispel the dark clouds. You know, Bones, I love your way of expressing your sentiments from tongue-in-cheek, to irony, sarcasm, thundering righteously, etc. Notwithstanding I believe these barbed bits directed at Francis, sandwiched as they are between invocations of the Most Holy Trinity, come dangerously close to blasphemy insofar as in such a faux litany prayer itself (always directed to God) is made out ot be a joke. Not intended by you surely, but to my eyes it reads so. Keep up your the usually excellent work. Try to avoid scandalizing anyone. It would be a shame to have anyone turn away from such an unusually versatile and orthodox blog due to this particular excess. My conscience does not convict me of blasphemy. The lights of my conscience informs me that Heaven likes a laugh as much as Earth every now and then. And conscience is so important, as His Holiness indicated to the Lutheran recently. Ah! And such would be your plea before the Throne of God, eh? First-time offender, invincible ignorance, defence of necessity, etc.? Unless the Almighty cracks a smile during your improv routine, Bones, it might prove prudent to inquire if St. Thomas More is available on your big day in Court. I asked a moral theologian and he said its fine. This is about the Holy Father? He is risking his life and visiting the most dangerous places in Africa, with Al Khaida and IS watching. Europe has forgotten about Africa. Well, Bones, if you've consulted with a moral theologian and he/she said it was fine I suppose that's all right then. Have him or her write you a theologian's excuse. You would, of course, have the inside track on this whole humour matter as I've read somewhere that God is an Englishman. Even so, as an Englishman, I suspect the last words you would want to hear would be: "We are not amused." Nice reductio ad absurdum, Bones, spinning your variation of "Did you hear the one about the Pope and the Lutheran woman?" 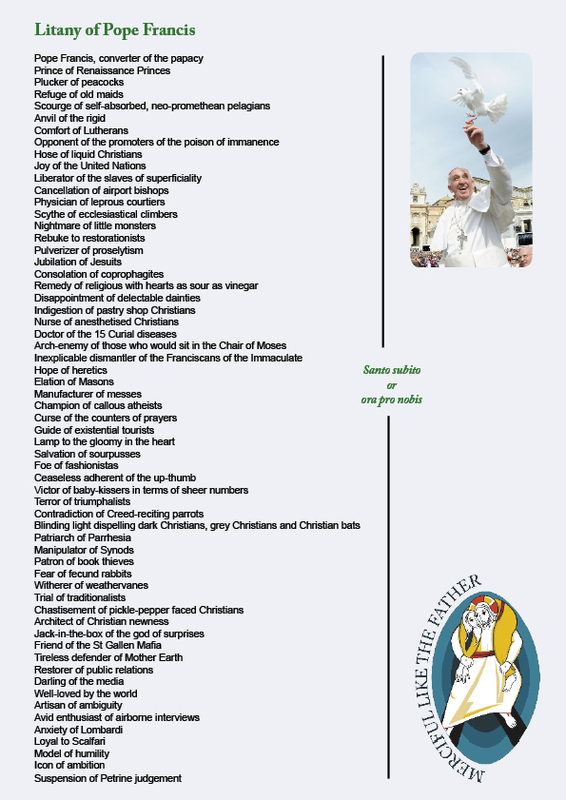 It's not right to put the mockery of Francis next to true invocations to God. They should be kept separate. The lines at the beginning and end are serious invocations and should only be used in a seriously prayerful manner, not associated with the other stuff. I've asked several Catholic friends now if they think its blasphemous. All of them are trads. None of them think it is blasphemous. Blasphemy is about an act to mock, ridicule or show lack of reverence for God. In this little work, I think it is pretty obvious, from a Catholic, that the invocation to the Trinity is done out of reverence for the Trinity. The prayer 'Lamb of God...' is done out of reverence for our Divine Saviour. What takes place in the middle is satire. God is not being satirised, Liam. God knows I did in no way wish to mock His Most Holy Name. This blog isn't and shouldn't be for me but for God and His Church, so if some readers believe I have blasphemed the Most Holy Trinity or caused scandal it is my duty to repair that. and added some more from readers. @Thomas. a heresiarch is to the sheep a little satan. The only blasphemy is to call a heresiarch Christ-in-proxy. Ignorance is rife as always and innocence the resource of devils as always. Anti-popes, false-popes, schisms...nothing new. What is new is to have all three sold as Catholic. We live in post-vii-novus-ordo times, which are unprecedented. The Protestant spirit is at a height having made its freemasonic way into parishes long ago. How else could a 'Catholic' basilica built in the 1800s have placed its high altar on the western wall? satan's sabotage -overt and subtle - the result is that after Vatican One was cut short... convincing Catholics that anything is Catholic has been very successful. VII has happened. It's Novus Ordo has happened. To sacrifice one's faith in order to continue to elevate a perverted 'cultural-catholic-bequeast' is positively nouveau protestant. In reparation I will pray this. Lawrence, in reparation for what? Calling a spade a spade or a spade a shovel? The protests to the 'litany' (protestants have no sense of humour or irony - or truth) are from the hearts and minds of those crippled by lies. But hearts and minds are more easily rectified on this side of the grave than bodies. Sancta Maria, Mater Dei, ora pro nobis. Folks with an investment in lies keep the damage high. Think twice the Liams and Lyndas of the Novus Ordo before disgruntelling yet again on Catholic Truth. The discomfort of the most discomforted Protestant is a joke to the Passion of Christ. I agree that intermingling genuine prayers with satire is, upon reflection, not a good idea. However, you did not do so with evil intent and have set the matter right. “The crowning disloyalty to God is heresy. It is the sin of sins, the very loathsomest of things which God looks down upon in this malignant world. Yet how little do we understand of its excessive hatefulness!… “We look at it, and are calm. We touch it and do not shudder. We mix with it, and have no fear. We see it touch holy things, and we have no sense of sacrilege… “Our charity is untruthful because it is not severe; and it is unpersuasive, because it is not truthful… Where there is no hatred of heresy, there is no holiness." And yes, God truly is an Englishman! That is why when He created breakfast, He made bacon and eggs. In reparation for any scandal caused for misuse of the prayers. "Notwithstanding I believe these barbed bits directed at Francis, sandwiched as they are between invocations of the Most Holy Trinity, come dangerously close to blasphemy insofar as in such a faux litany prayer itself (always directed to God) is made out to be a joke. Not intended by you surely, but to my eyes it reads so." My counsel was: "Try to avoid scandalizing anyone." That's all. And your counsel was heeded. Europe is praying the praise for being a blasphemous continent. The Yihadis are among us too. Sancta Maria ora pro nobis! What on earth, Viterbo? You're making no sense and please quit with the personal insults and assumptions. Keep to the objective issues. I'm surprised by your rudeness. You can and ought to make your point without attacking others especially on the basis of positions that you have falsely and absurdly implued that they hold. Don't you understand the criticisms were not to do with mocking Francis's evil-doing but with putting same in a prayer alongside serious invocations to Our Lord God. It is the irreverence to God, not Francis that is in issue. You should know me well enough after a few years commenting on Mr England's and others' good websites. Dr Lamb, I presume?!! 😉 Hope you're keeping well. Kyrie eleison, Lynda. No, I won't quit, however you phrase what you see needs quitting (if I peg out in the night then all things being equal...). Truth is demanding, I know you know that. To equate the criticism of a heresiarch with blaspheming Our Lord is basically the Novus Ordo moot. Anyone apologising for their idea of 'god' via the means of Bergoglio is...the mystery of iniquity comes to mind. If I have stopped making sense, then just ignore a silly comment. Nothing to stress about. PS. I see your point, Lynda.. the 'Liams and Lyndas'...my meaning being how crucial the so-called Irish claim to Catholic Truth is...not that yous were making such, but why, if there is any Blood of Christ left on Irish soil, make a defense of the indefensible? My Nana would turn over in her grave, 'cept she be in heaven. I think it's hysterical and just the kind of satire needed to keep all of us even keel. The only one I might have changed was "model of humility" into "showpiece of humility". But very well done. This is the kind of satire that keeps us in good humor during dark times. I thought it was quite funny. "Nightmare of little monsters." LOL. It actually reminded me of a litany drawn up by members of the TFP years ago. It contains some weird stuff, too. I remember that "Axiological Principle" was one of the invocations. You forgot "Basher of bead counters" unless I missed it.